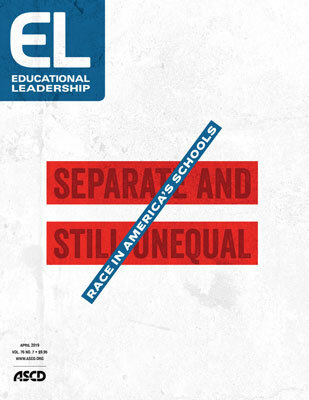 Segregation-era black educators set the groundwork for an equitable and aspirational education system for all. How can we get back to their vision? Despite the challenges, efforts to further and support integration remain indispensable. How can education leaders respond to population shifts and housing preferences to keep the promises of Brown alive? Black girls deserve to be treated like the developing young people they are. Despite popular wisdom, teachers should never treat racial discussions with students as a "moment's theater." Students experiencing racial inequities can't wait for schools to move at their own pace and comfort level. Cultivating awareness of unconscious biases can help schools shrink opportunity gaps. Studies of assignment quality show that black students continue to be subject to deficit thinking. When school leaders overlook race in their data analyses, the consequences for students can be damaging. How do we progress in exploring questions about race and schools that many try to avoid? How schools can teach the common good. Watch the video. Approaches all leaders can use to help students of color. Four key practices to support students of color. After 50 years in schools, I know racism is not a "distant memory." ASCD Policy Priorities / Raise the Caps! Cuts to education funding loom—unless Congress acts. Readers share how they changed their curriculum or teaching practice to be culturally inclusive. Reader responses to recent issues of EL. Turn & Talk / Robin DiAngelo on Educators' "White Fragility"
An interview with the sociologist and author of White Fragility on teachers' critical role in addressing implicit bias. Findings from reports by the National Bureau of Economic Research and the IZA Institute of Labor Economics. This new book from Aaron M. Johnson offers educators a paradigm to help connect literacy instruction to black males' lived experiences and values. Numbers of Note / Resegregation of Schools? How a historic high school equalized access to high-level courses. The words we use to label students can either lift them up or box them in. Chaunté Garrett describes how inequitable policies and practices are keeping segregation within schools alive. Watch the video.